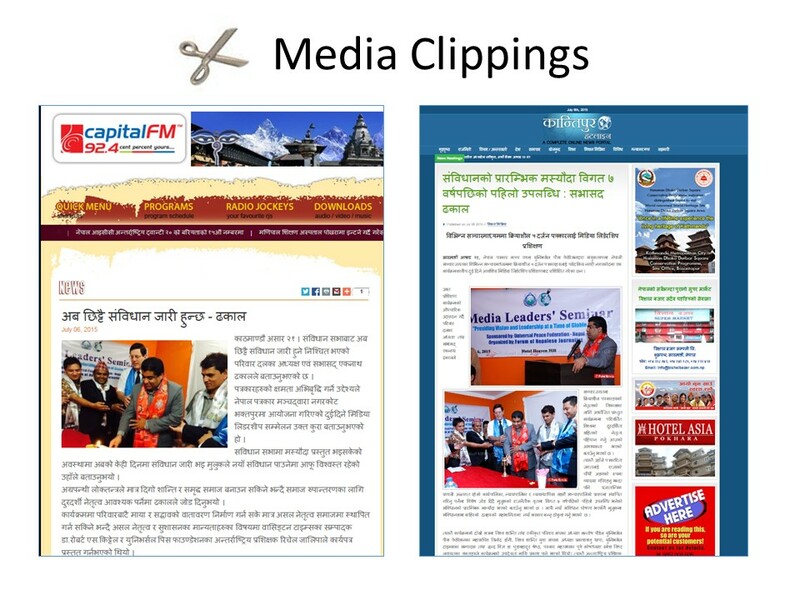 UPF Nepal, Nagarkot, Nepal: Sixty professional journalists from print, television, radio, wire services, the government and on-line media agencies gathered for two days just outside the Kathmandu valley for the first Media Leaders’ Seminar, July 5-6. 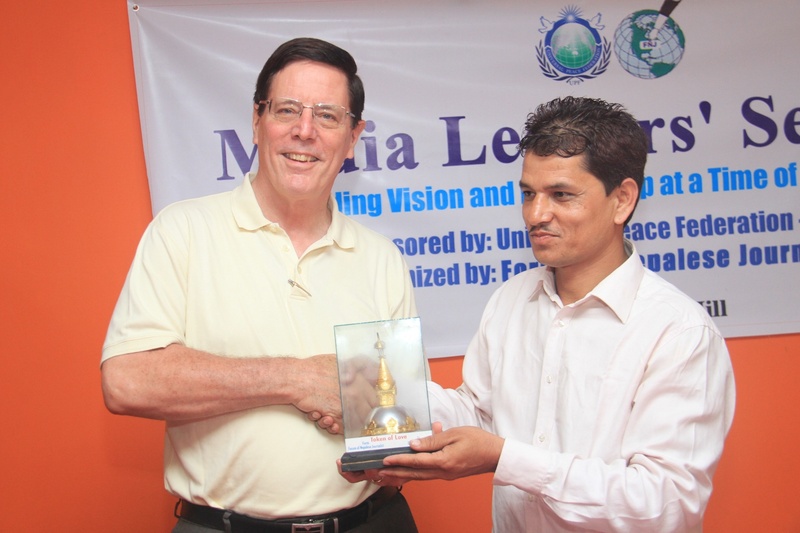 After being introduced to the philosophy and activities of the Universal Peace Federation, offered their full support for UPF-Nepal’s vision of social transformation. 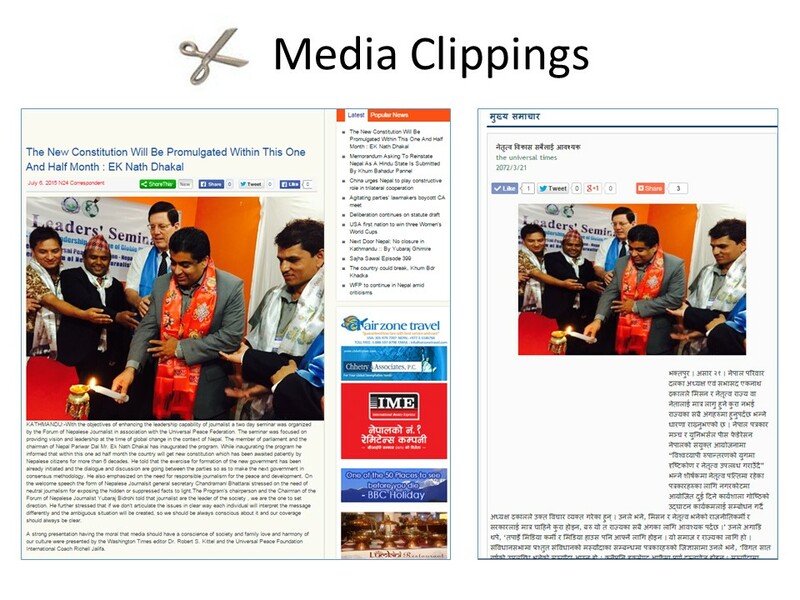 The theme was, “Providing Vision and Leadership at a Time of Global Change.” It was organized by the Forum of Nepalese Journalists (FNJ), a coalition of nearly 400 professional media persons working throughout Nepal. The Universal Peace Federation-Nepal helped to co‑sponsor the event. This was the point of convergence. Social transformation is also one of UPF’s main goals which it seeks to accomplish through education that focuses on clearly defined Universal Principles of Peace. At the Opening Session on the first night the Chairman of UPF-Nepal, Hon. Ek Nath Dhakal, who is a Member of Parliament and former government minister, outlined an alternative political strategy termed, Headwing Democracy. This philosophy seeks to span the ideological divide between democracy and communism by analyzing the strengths and weaknesses of both systems of government. For example, one of the major shortcomings of both isms is sidelining spiritual and moral values. Dr. Robert Kittel, the Director of Education for UPF-Asia, gave an overview of Father Moon’s investment in creating a worldwide media empire. The UPF Founder the called, “the conscience of society.” Dr. Kittel then shared two key concepts of Father Moon’s teachings: the Principle of Living for Others and the Principle of One Family Under God. 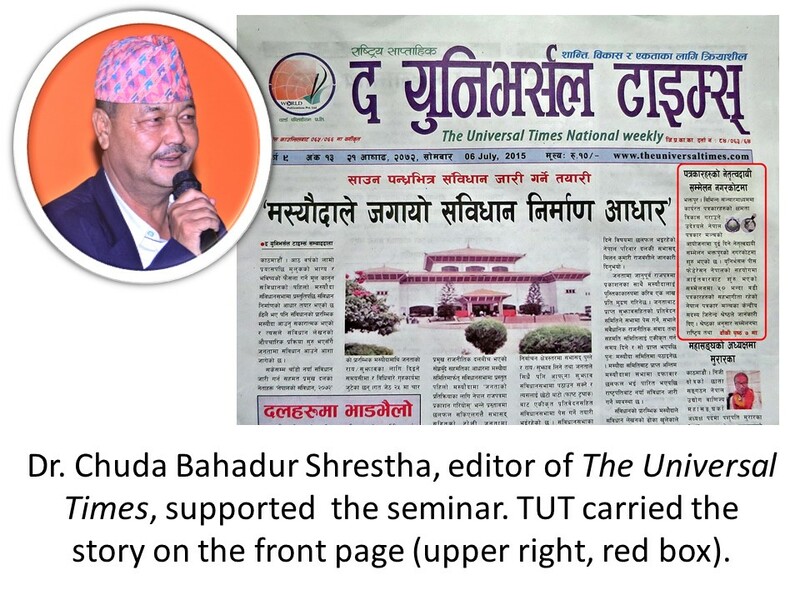 The Universal Times (TUT), a national weekly paper, surprised fellow journalists by distributing the paper on the morning of the last day of the seminar. 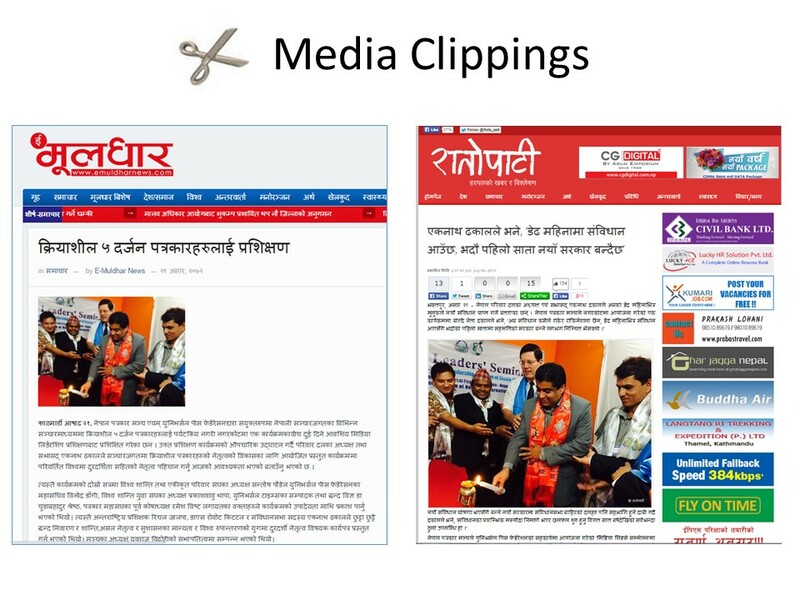 On the front page was an article about the media conference itself. Dr. Chuda Bahadur Shrestha, editor of TUT, participated in the program and strongly supported the idea that marriage is an essential social institution needed to address many social ills. Mr. Binod Dangi, Secretary-General of UPF-Nepal, outlined Federation’s extensive work in Nepal carried out over the past 1.5 decades. Mr. Yubaraj Bidrohi, the FNJ Chairman, spoke at the end of the 2-day program. He was grateful for the insights that UPF’s educational materials provided and said that they wanted to continue the relationship and fully support UPF activities in Nepal.